If you want to become a Cardiac Care Nurse, it is important to learn about the special training and experience that may be required. Cardiac Care nursing professionals will work directly with patients who are suffering from heart-related conditions. These specialty nurses will work with patients who have recently undergone surgery or who are on their way to rehabilitation. Because many patients undergo surgery and other procedures, Cardiac Care Nurses must build a close relationship with patient’s physicians, surgeons and other nursing staff. In addition to providing care, it is common for a nurse in this specialty group to educate patients and their family members on conditions and prevention after treatment. If this sounds like the career path you would like to take, learn what you need to know so that you can get the training you need to enter the field. The first step to becoming a Cardiac Care Nurse is to get licensed as a Registered Nurse. There are several different paths to take to become an RN, but the most common route is to earn a Bachelor of Science degree majoring in nursing. Once you have earned your BSN from an accredited school with a respected nursing program, you will have a broad knowledge of medical areas. The same broad knowledge that is needed to pass your National Council Licensure Examination. Once you pass your NCLEX-RN exam, you will be able to include the RN label after your name on your resume. 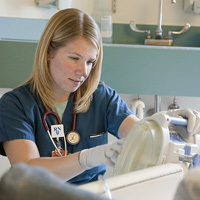 You can start practicing as a Registered Nurse and start gaining valuable nursing experience. Cardiac Care nursing is a specialty, and like most specialties in nursing, you will need additional training to earn your specialized certification. All nursing professionals need to take continuing education courses to satisfy renewal licensure requirements, and taking courses in cardiac care can help you. You should also look for clinical practice opportunities where you can gain cardiac rehabilitation experience. You will need clinical and instructional education hours to satisfy the certification requirements through the American Board of Cardiovascular Medicine. This is the agency that offers certifications for cardiac nurses by administering a certification exam. You can take courses through the American College of Cardovascular Nurses, which serves this specialty community, or look for other specialized programs. Just be sure that the courses that you select are delivered by trusted professors at a trusted institution that is accredited and recognized by the ABCM. If the programs are not accredited, the credit hours that you complete may not be counted towards requirements to get certified. After you earn your certification as a Cardiac Nurse, you will need to be recertifed regularly. This is why it is so important to stay up-to-date on technologies, procedures and changes in the field of cardiovascular medicine. If you would like to work as a cardiac care nurse, you need to be able to keep up with a high-pressure environment. According to The News Observer, since the demand for nurses within this specialty are so high, it is not unusual for cardiac care specialists to have five or six job offers before they even graduate. As the demand for care increases, the number of openings to fill will increase too. Decide if this is the right specialty for you, and take the steps to become a cardiac care nurse if you think this is the best path.